› Author AffiliationsThe project has been supported by the National Basic Research ­Program of China (973 Program, No. 2015CB856600) and the Natural Science Foundation of China (21332002). Transition-metal-catalyzed cross-coupling reactions through metal carbene migratory insertion have emerged as powerful methodology for carbon–carbon bond constructions. Typically, diazo compounds (or in situ generated diazo compounds from N-tosylhydrazones) have been employed as the metal carbene precursors for this type of cross-coupling reactions. Recently, cross-coupling reactions employing non-diazo carbene precursors, such as conjugated ene-yne-ketones, allenyl ketones, alkynes, cyclopropenes, and Cr(0) Fischer carbenes, have been developed. 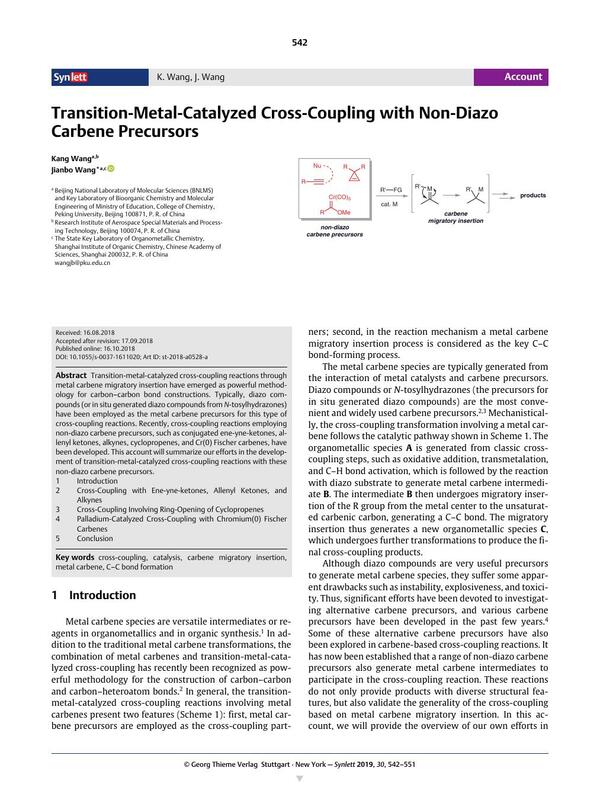 This account will summarize our efforts in the development of transition-metal-catalyzed cross-coupling reactions with these non-diazo carbene precursors.